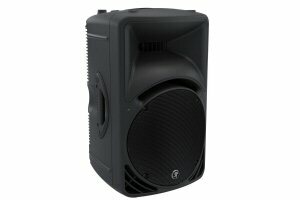 The Mackie SRM450 V3 now in stock and on demo in Nottingham. The V3 is a brand new updated version of the original SRM450, one of the most widely used two-way PA speakers ever to grace the industry. The original boast both clarity and power and the new V3 builds upon that with an array of updated specifications. Sporting a 12” high output low frequency driver and 1.4” titanium dome compression tweeter, both powered by a powerful 500 Watt amplifier to give a 1000 Watt system power rating, the SRM450 V3 is more than capable of handling anything from small functions up to large scale venue use. Driver time alignments, phase correction and an automatic feedback destroy function mean the SRM450 V3 will perform beautifully regardless of the environment they are placed in or the quality of equipment that plugged into them. Couple that with a speaker mode button that allows for quick EQ preset selection between PA, DJ, Monitor or Soloist settings, it is incredibly easy to match the SRM450 V3 with your performance style. 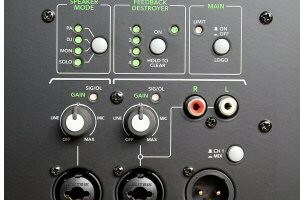 The SRM450 V3 also comes with an integrated two channel mixer with Mackie Wide-Z inputs and can take input from guitars, microphones, mixers, keyboards and more with simple adjustment of the gain control. It also inputs via unbalanced RCA for numerous other connectivity options. With the addition of Smart Protect DSP for protecting against high SPL damage, monitor specific angle and voicing modes and a highly durable design, the Mackie SRM450 V3 is the perfect accompaniment for any gigging artist or for permanent installation.